Mitamysi rolls its sleeves up! 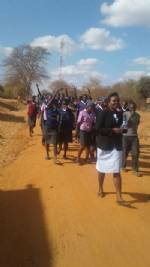 On 25th October Mitamisyi secondary school took action in support of the national ban on plastic bags. 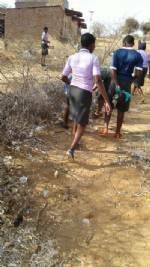 The school community, teachers and students carried out a clean up exercise in their local village - Mitamisyi shopping centre. It was a school and community day. The pictures depict the students walking to the town from school led by one of teachers, and the Principal and BOM representative.addressing parents/shop owners before the start of the exercise. The students are carrying garbage/plastic papers collection. They plan to be carrying out this exercise occasionally . The platform will be used to educate the public about the importance of living in a clean environment. The school will will also double the usefulness of the occasion to inculcate spirit of service to community into the students.